Your purchase of PADI Open Water Diver course includes EVERYTHING!! No additional costs! This is why the eLearning is so great, you begin your dive education at your convenience, anywhere you have Internet connection. If you have a busy schedule or just prefer the convenience of online study, eLearning is a great choice. With the information you already provided upon booking this course, a Capt. Hook's dive professionals takes care of everything to get you started. We sign you up for the course and call you to go over any questions you may have. There is no faster way to get started. 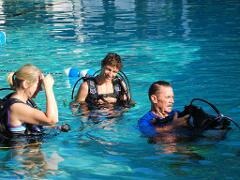 Your course work will be taught online with proven PADI professional materials and interactive instruction. The online portion will take approximately 12-15 hours to complete. 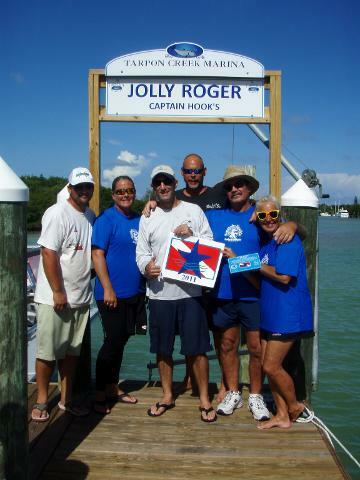 Once you complete it, it is off to the beautiful Florida Keys and to Captain Hook's to do you In-Water Training. PADI will also send to you medical forms, that you will need to read, answer the questions and sign prior to the in-water skills training. 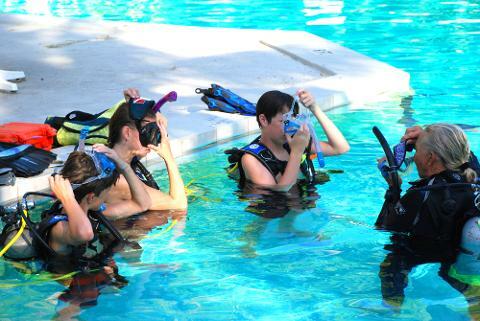 After a short quiz, you will learn your dive skills in a swimming pool with your instructor. Skills complete...great, now it is on to the open water to do your certification dives one and two. 4 Open Water Dives with an instructor, using the skills you’ve practiced in the pool and now exploring the world under the surface! Captain Hook’s provides you everything to get certified. That includes all scuba equipment and air for your confined water (pool) skills training and your 4 open-water checkout dives. 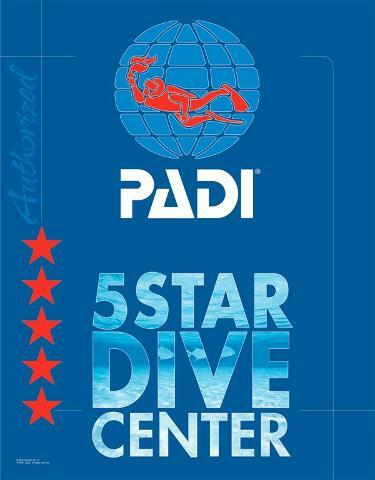 PADI registration and PADI permanent Certification Card is included. 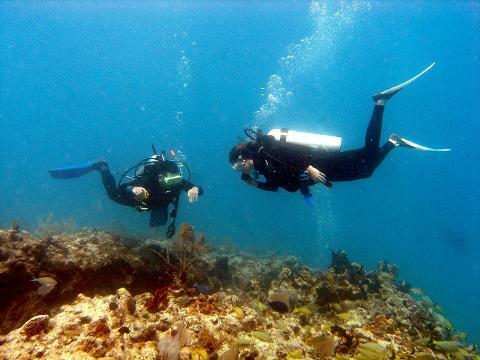 At Captain Hooks, under the guidance and instruction of our experienced PADI dive instructors, the Open Water Course has been designed for safety, personal comfort levels, multiple learning approaches and lots of FUN!! 1. Go to the Booking Calendar and select the first day that you would like to start your in-water training. Be certain to select the quantity of participants for the course. Complete the booking and fill out all of the information requested. You will receive an email confirmation from Captain Hook's of your booking. We then go ahead and register you for the course and we call you so you can start right away. Please note, in order to do eLearning, each student must have a unique email. Now,you can access interactive presentations that include videos, audio, graphics and reading. Short quizzes let you gauge your progress and review and correct anything you might happen to miss. This lets you move through the program efficiently and at your own pace. We will be notified by PADI of your progress along the way. 2. Give us a call at 305-743-2444 and ask for Denise, our Director of Dive Operations and Training to answer any questions about the PADI eLearning site. Your PADI Crew Pack (student folder, Open Water Manual, Recreational Dive Tables and Training Logbook) will be provided to you on your arrival date with Capt. 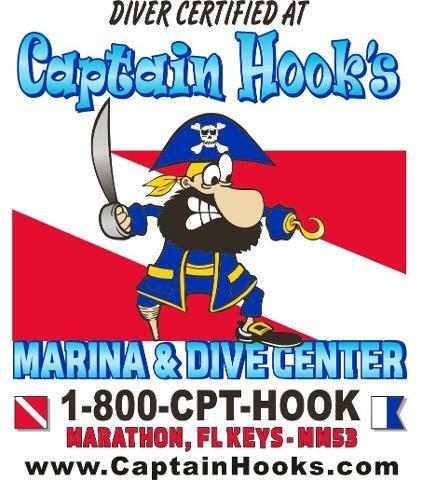 Hook's and you will finish your in-water training at Captain Hooks, our PADI 5 Star Dive Center. Have fun and ask our dive professionals about your savings on equipment and additional dives while you are on vacation!